The homeownership rate peaked in America in 2004 at approximately 69.2 percent. Homeownership is defined as the percent of occupied housing units (households) that are owner-occupied. The homeownership rate in 2013 is roughly the same as in 1995. The gradual decline continues. 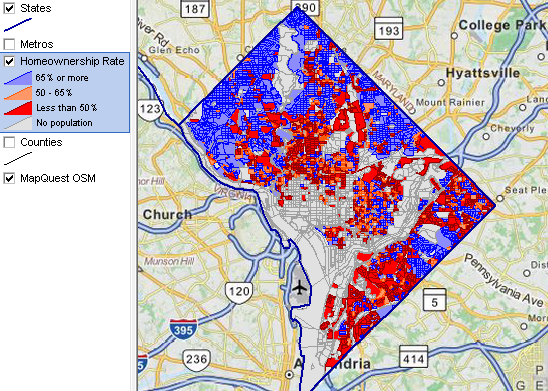 The focus of this section is on creating thematic pattern map views depicting homeownership by census block for the Washington, DC area. This section builds on the previous post Mapping Demographic Patterns: Census Blocks. The starting place is where Mapping Demographic Patterns: Census Blocks left off — the required software and GIS project are installed on the computer. The next step is to start the CV XE GIS software, open the DC GIS project and set the intervals for the thematic pattern views. To compute homeownership, the minimum required data items/fields are the number of owner-occupied housing units and the number of housing units. By examining the Census 2010 SF1 table shells (xls), these items are found in Table H4. Tenure — owner/renter occupancy of occupied units (line 9259 in the xls file). Looking at the SF1 technical documentation (pdf) matrix section (sequential page 483, numbered page 6-321), it is determined that the items field needed are (H0040002 + H0040003) — owner occupied housing units and H0040001 (occupied housing units). These items are already loaded into the DC block shapefile dbf. Intervals are defined for the map view with queries that set blue to blocks with homeownership rate of 65% or more, orange to blocks with rate 50%-65% and red to population blocks with a rate below 50%. Zero population blocks are set to gray. The initial view shown below tells the visual story that more of Washington, DC has a homeownership rate below the national average than above the national average — and how these homeownership rate patterns are distributed by block. Similar thematic maps showing patterns of homeownership rate by census block may be created for any area in the U.S. Procedures to access and use these no cost resources for Census 2010 Summary File 1 census block applications are summarized in the the APIGateway Guide. In a future post, homeownership rates will be reviewed for all states and metros, 2008 through 2012, using annual American Community Survey (ACS) data. This entry was posted in APIGateway, Census Blocks, decision-making information solutions, Geographic Information Systems, Homeownership and tagged 2010 United States Census, American Community Survey, Application programming interface, Census 2010, Census block, Geographic information system. Bookmark the permalink.